This Häagen-Dazs cafe will tantalise your taste buds, as you would expect from the wide range of ice creams on offer. 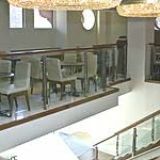 The friendly staff and selection of fragrant teas and delicious pastries makes afternoon tea a pleasure. Do you work at Haagen Dazs? What did you think of Haagen Dazs? When I attended, the staff told us the machine that made the syrups had broken - but they were extremely nice and the kitchen provided these handmade sauces for us to try. It was still exceptional stuff - well done to the staff for making the best of a bad situation! WOULD NEVER GO BACK!! they badly need to change their staff asap! very rude customer service. and definitely not what you expect after paying a premium price. Rude staff on door, makes you feel worthless. Will not be going back. Only surviving because its in Leicester Square. Superb ice cream from those who know it best returns to Leicester Square in time for the sun. What remarkable timing. In the fever-busy space that is Leicester Square, Haagen-Dazs cafe has reopened and made itself quite literally bigger and better. Stepping inside into the beautifully slick cafe, you’re greeted by a host who gives you a choice of tables – as long as it’s not too busy. 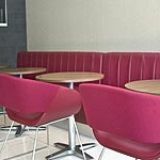 The colour scheme fits perfectly with the famous ice-cream company, full of creams, taupe, dark browns and reds, making it a welcoming and easy place to sit and indulge. A portion of the back wall is covered with wallpaper full of raspberry close-up, breaking up the beige accented by the various deep red seats. Despite bright lighting with the help of two wonderful chandeliers, the cafe has kept a sense of intimacy for each table to enjoy. 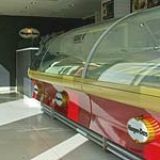 If you don’t fancy a sit-down pleasure, there is also an ice-cream bar for tempted passers-by. You can expect to find anyone and everyone here, from couples on a first date to a group of fifteen teens. Soft music is played in the background, on par with the easy-going, happy vibe. 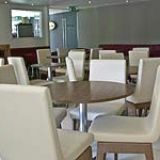 All the staff are very helpful in suggesting what’s best and explaining the menu - which is very large and ever so slightly complicated. 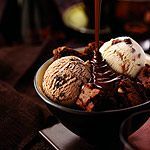 With a massive choice of twenty-four different ice-cream flavours and a selection of crepes, waffles, sauces, brownies and cookies, you’re sure to find something - or a few things - to satisfy your sweet tooth. The newest addition, white chocolate and raspberry ice-cream, offered as a sample on sitting is creamy and works well with the fresh tartness of raspberries, helping it to a clean finish. One scoop of the beautiful caramel and crunchy macadamia nut brittle teamed with tiramisu ice-cream (with subtle hints of espresso) is a match made in heaven (two scoops £4.95). The fluffy Belgian waffle (£2.35) on the side is deceptively sweet, so unless you’re as sweet as sugar, no sauce is needed. In just a scoop (one scoop £2.90) of banoffee ice-cream, Haagen-Dazs has managed to bring together an entire dessert. A distinct banana flavour accompanied with the sweet toffee and creamily smooth texture means it absolutely does what it says on the tin, and is delicious. The butterscotch sauce (one topping 60p) is disappointing as it lacks any real flavour, but maybe with a scoop of plain vanilla, it’d be appreciated. A latte (£2.90) has rich coffee notes and goes very well with any chocolately pudding on the menu. The raspberry dacquiri (£7.10) made with fresh raspberries, rum, lemonade and raspberry sorbet has an exciting fizz on the tongue and ends with a fairly strong rum after taste, but is still dangerously easy to drink. The tequila sunrise (£7.10), blended with mango sorbet, grenadine, orange juice and tequila has a much bigger kick to it and could do with a bit more mango flavour to equal the orange juice. Haagen-Dazs Leicester Square has only been back open for a couple of weeks and already queues are forming outside. And it’s no wonder why. The extensive menu of suggested combinations, fondues, make-your-own, cocktails and milkshakes shows there’s no end to how far a scoop of ice-cream can go. Slightly pricey but definitely worth a trip for a deliciously indulgent treat. Really overpriced for what it is. It's really really average inside. It could be such a nice place. But it's not. Overrated, poor service and too expensive. If this place wasn't located in Leicester Sq they wouldn't have any customers, dizzy tourists and the reputation for good quality ice cream is their saving grace. Go to Cookies & Cream in Whitechapel if you want a better experience and don't want to be ripped off. I complained to the manager about his manner, and she laughed in my face, as well as in the face couple sitting next to me, she had no compassion, and seemed to side with her rude staff members. Do not eat here, worst service in Britian and will make you feel like an inconvenience to thier night, as you are not important. boycott. Ben and Jerrys only from now on! It's hard not to love ice cream - esp Haagen Dazs! Usually I just have a couple of scoops post-flick, but the afternoon tea is scrummy! It's still Leicester square, mind... you've been warned!